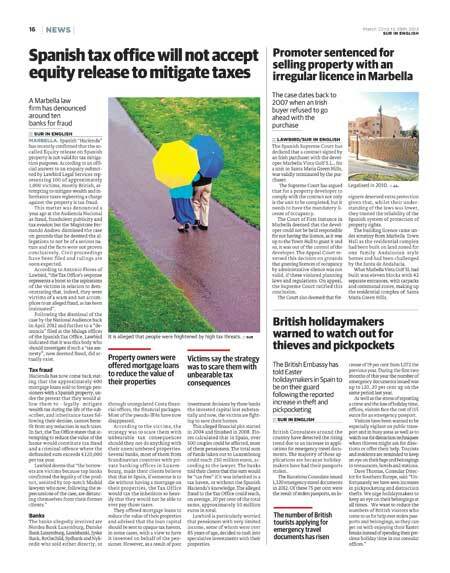 Spanish “Hacienda” has recently confirmed that the so-called Equity release on Spanish property is not valid for tax mitigation purposes. According to an official answer to an enquiry submitted by Lawbird Legal Services representing 100 of approximately 1,000 victims, mostly British, attempting to mitigate wealth and inheritance taxes registering a charge against the property is tax fraud. This matter was denounced a year ago at the Audiencia Nacional as fraud, fraudulent publicity and tax evasion but the Magistrate Fernando Andreu dismissed the case on grounds that he deemed the allegations to not be of a serious nature and the facts were not proven conclusively. Civil proceedings have been filed and rulings are soon expected. According to Antonio Flores of Lawbird, “the Tax Office’s response represents a boost to the aspirations of the victims in relation to demonstrating that, indeed, they were victims of a scam and not accomplices to an alleged fraud, as has been insinuated”. Following the dismissal of the case by the National Audience back in April 2012 and further to a “denuncia” filed at the Malaga offices of the Spanish Tax Office, Lawbird indicated that it was this body who should investigate if such a “tax amnesty”, now deemed fraud, did actually exist. Hacienda has now come back stating that the approximately 600 mortgage loans sold to foreign pensioners with a Spanish property, under the pretext that they would allow them to – legally- mitigate wealth tax during the life of the subscriber, and inheritance taxes following their demise, cannot benefit from any reduction in such taxes. In fact, the Tax Office states that attempting to reduce the value of the home would constitute tax fraud and a criminal offence where the defrauded sum exceeds €120,000 per tax year. The banks allegedly involved are Nordea Bank Luxemburg, Danske Bank Luxemburg, Landsbanki, Jyske Bank,Rothschild, Sydbank and Nykredit who sold either directly, or through unregulated Costa financial offices, the financial packages. Most of the pseudo-IFAs have now disappeared. According to the victims, the strategy was to scare them with unbearable tax consequences should they not do anything with their unencumbered properties. Several banks, most of them from Scandinavian countries with private banking offices in Luxembourg, made their clients believe that that in Spain, if someone is to die without having a mortgage on their properties, the Tax Office would tax the inheritors so heavily that they would not be able to ever pay those taxes. They offered mortgage loans to reduce the value of their properties and advised that the loan capital should be sent to opaque tax havens, in some cases, with a view to have it invested on behalf of the pensioner. However, as a result of poor investment decisions by these banks the invested capital lost substantially and now, the victims are fighting to save their homes. This alleged financial plot started in 2004 and finished in 2008. Flores calculated that in Spain, over 500 couples could be affected, most of them pensioners. The total sum of funds taken out to Luxembourg could reach 250 million euros, according to the lawyer. The banks told their clients that this sum would be “tax free” if it was inherited in a tax haven, or without the Spanish Hacienda’s knowledge. The alleged fraud to the Tax Office could reach, on average, 20 per cent of the total sums, approximately 50 million euros in total. Lawbird is particularly worried that pensioners with very limited income, some of whom were over 85 years of age, decided to rush into speculative investments with their properties. This entry was posted in In the Media and tagged Antonio Flores, Equity Release, Lawbird on March 22, 2013 by admin.